Peer over the shoulder of a multitude of painters who use a variety of media to draw the beauty that is the Steveston sea walk at the eighth annual Grand Prix of Art starting at 10 a.m., Sat. Sept. 8. The artists will assemble at for the 9 a.m. check-in at the Britannia Heritage Shipyards. They will receive their location by lottery. When the Gulf of Georgia Cannery Museum’s whistle blows at 10 a.m. they’ll be off and painting spread over 40 locations. 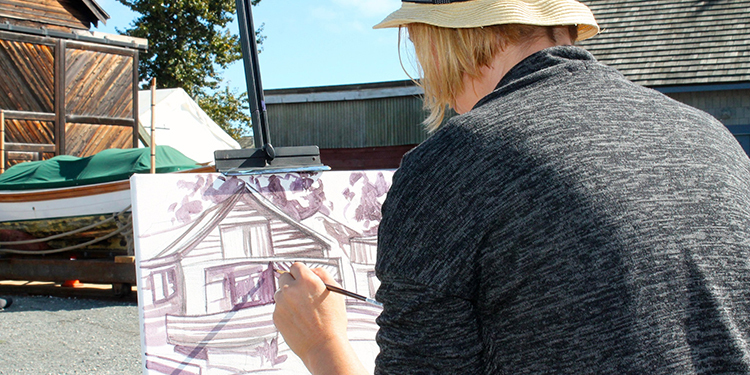 For three hours, over a hundred artists will work, en plein air, or outside, right on location scattered around Steveston predominantly along the boardwalk from Britannia Shipyard to the Gulf of Georgia Cannery. Scattered along the painting route, starting from Britannia, and continuing throughout the village, all viewers can enjoy nibbles, sips and music at multiple venues. Attendance is free. You also have a chance to get your photo taken inside a large mock-up of the Richmond Sentinel’s front page. Watch to see whose picture is chosen to be on our coveted Twitter feed. It’s brushes, pastels, pencils and paints down when the Cannery’s whistle blows at 1 p.m. but the festivities continue through the afternoon and on to the next day. There’s a 3 p.m. Saturday show of the art created. On Sunday afternoon the art created goes on sale. Also on Sunday, from 2 to 4 p.m. the Rivers End Fisher Poets offer their verbal wares for all to enjoy at the Cannery Museum. It’s like the famous cowboy poets but with a nautical flair. The Grand Prix of Art ends with the 4 p.m. Sunday award ceremony. Who will win the coveted Coast Capital Savings’ People’s Choice Award? Have your say. Vote for your favourite. According to Ted Townsend, City of Richmond spokesperson: “(There is) $5,000 in cash and prizes for Youth Awards and Open Category winners along with a new Masters Category Grand Prize. This event makes art accessible to all. It’s art in our midst. It is fascinating to see artists painting what they see in front of them, each interpreting the vista with their preferred medium, with their own vision. Sometimes, there are three different artists at each location, each choosing a different way and different focus to record the scene. The artists range from casual hobbyists to experienced professionals. This is your chance to get up close and personal with art because, art is for everyone! Click here more information or pick up a copy of The Richmond Sentinel for its pull-out, and take-long, centrefold that lists all event, locations, and offers a site map for painters, fun, food and music as well as a list of bargains at Phoenix Art Workshop, the Grand Prix host. The Richmond Sentinel is available at all Richmond Public libraries, many malls, shopping centres and all community centres.